As with any case, you should begin formulating hypotheses based on a referral. Even though this is a useful process, not every script is accurate or even that descriptive. This upper 60's male patient had a referral of "knee pain." As you know, there are many different pathologies that can refer to the knee. We must consider the back, SIJ, hip, knee, and foot/ankle at the very least. After meeting the patient in the waiting room, I noticed several key things with the patient's posture and gait. The patient stands and walks in about 45 degrees of external rotation bilaterally in the lower extremities. As you might imagine, this can easily stress the tissues located medially along the knee. Also, with the patient wearing sandals, I was able to notice significant pes planus bilaterally as well. With the subjective interview, I learned that the patient's pain was located generally on the left knee medial to the patella both in the distal thigh and proximal tibia. The patient was unable to identify any mechanism of injury but the pain began intermittently about 2 months ago and become relatively constant 2.5 weeks ago. Again, the patient was unable to explain the change to constant pain. The patient then reported that pain was more prevalent in knee flexion and squatting, but alleviated by extension or manual pressure. No history of joint locking/catching, but the patient did state his knee sometimes gave way. Other than that, the patient couldn't link any specific activities to knee pain and denied any numbness and tingling. All other red flags were negative as well. At this point, due to the patient's age and aggravating/alleviating factors, I had several hypotheses. Meniscal tears/osteoarthritis were easy targets due to the location of the pain and age of the patient. Saphenous nerve irritation or medial retinacular fiber irritation were possibilities due to the location of the symptoms and potential for stress as a result of the patient's gait pattern. MCL injury was possible but unlikely due to the pain location but with the lack of a mechanism of injury seems unlikely (even though postural stress can irritate it as well, so I still wanted to inspect it). At this point, lumbar, SIJ, and hip must still be ruled out as the source of pain. Lumbar ROM: WNL and pain-free. Repeated flexion and extension negative as well. Hip ROM: extension and external rotation WNL bilaterally. Internal rotation decreased significantly bilaterally (L > R). Hip flexion was moderately limited bilaterally. All motions without pain. Knee ROM: extension was WNL, however overpressure resulted in pain. Flexion was WNL but pain was intermittent throughout the motion with no pain at end range overpressure. Hamstring length was moderately decreased bilaterally. Tibial internal rotation was essentially non-existant bilaterally, and the patient was sitting in tibial external rotation as well. Both tibial internal and external rotation recreated pain. Ankle ROM: plantarflexion WNL and pain-free bilaterally. dorsiflexion limited bilaterally (L > R) with no pain. Strength of bilateral extremities was strong and painless throughout, including quadriceps contraction. This is important to note, because this decreases the likelihood of retinacular fiber involvement. At this point, I'm relatively confident that the lumbar spine is not the source of the patient's pain. Even though there is no significant diagnostic accuracy to ROM, repeated motions, and the Lumbar Quadrant Test, all were full motion and did not reproduce pain. This combined with the negative SLR Tests helps to rule out lumbar disc related pain. SLR and Crossed-SLR Tests have good sensitivity and specificity respectively. I performed 4/5 tests in the SIJ Cluster and all were negative, so I was able to lower the likelihood that SIJ was the source of pain. With FABER and POSH Tests negative and hip ROM overpressure not producing any pain, I did not think the hip was the source of the patient's pain; however, with the ROM limitations, I did begin to suspect a contribution to the patient's pathology. Like I mentioned earlier, with no pain with resisted knee extension, I lowered the likelihood of retinacular fibers as the source of pain. Same thing with the Valgus Stress Test. If the MCL was being strained, it would have been painful. With only 2/5 conditions met for the Meniscal Cluster, I was unable to rule in or out meniscus as the source of the patient's pain; however, I was leaning away from that as the patient described feeling "relief" with pressure. The vague description of the pain is more commonly associated with nerve lesions. Something I should have looked at the eval was potential for femoral head retroversion (I looked at this on his second visit thanks to a recommendation from my mentor) with Craig's Test. It did end up being positive bilaterally. Now that we know the source of the patient's pain, we must determine why it is painful. Let's go back to the original presentation of our patient: significant ER of the lower extremities bilaterally in both stance and gait. The patient likely ambulates this way for two reasons: femoral head retroversion and decreased dorsiflexion ROM. The lack of utilization of hip and tibial internal rotation over decades results in lack of ROM in those directions. As a result, the patient ambulates in external rotation which had been stressing the medial structures, in this case the saphenous nerve. My goal then was to increase hip and tibial internal rotation and ankle dorsiflexion ROM followed by gait retraining to take some stress off those medial structures. 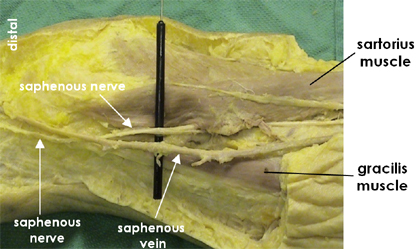 So what other clues led to my determination that the saphenous nerve was the culprit? First of all, nerve pain tends to be a little more vague and harder to localize. Patients are usually able to point with one finger where their pain is. Now this is definitely not always the case, but it is common. The knee angle's effect on pain was difficult for me to fully comprehend initially as the patient had on and off pain with flexion and relief with extension. However, the patient had pain with extension overpressure. Well if you look at this picture, you will see the saphenous nerve actually runs posterior to the knee flexion/extension axis. This would indicate that extension would cause pain. While this is possible, I am more convinced that the patient's extension overpressure pain was the result of some meniscal lesions that are otherwise non-symptomatic (remember we had a few tests positive in the cluster). Every anatomical presentation tends to be different, so maybe this patient's saphenous nerve runs closer to the axis of rotation in the knee, thus causing pain in flexion. At this point I am speculating, but it is something to consider in your diagnosis. This resulted in both increased tibial IR and ankle DF ROM. The patient's HEP included this technique (minus the band), the windshield wiper stretch from the 1st video, hamstring stretch, and forefoot adduction with theraband. I added the last exercise because it has been shown to activate the posterior tibialis the greatest and is the primary medial arch supporter (remember the pes planus bilaterally). The patient described significant relief in pain following the evaluation and treatment that day. The patient came in a couple days later and reported reduced pain from a week ago. I performed the same treatments as described above. Once I had improved mobility, I proceeded to educate the patient on neutral subtalar positioning in stance and normalized gait. I had him perform some squats with his lower extremities in decreased external rotation and neutral subtalar positioning. I finished the day by training the patient's gait in less external rotation compared to his "normal" form. I do not expect to have the patient ambulate with his feet pointing straight forward due to the retroversion of his hips. The patient again expressed improvement in pain following treatment, especially with the tibial IR MWM in half-kneeling. With one or two more visits to focus more on maintaining our results and changing gait form, the patient should be ready for discharge.